From the first tender strawberries of spring, to summer's bursting blueberries, to the cranberries that brighten up our winter tables, the beautiful juicy fruit is bountiful all year long. And because they preserve so well, berries easily carry over the seasons, so you can make the most of the tiny gems, no matter what the calendar says. A ruby-red assortment rests on a pillowy meringue in this party showstopper. Keep in mind that even a speck of grease will ruin your meringue, so it's important to start with clean tools. For the highest, most impressive peaks, don't forget to bring egg whites to room temperature before beating. This blueberry-studded cake works as a sweet breakfast, brunch, or light dessert. Serve it with a side of eggs for overnight guests, or with fresh whipped cream on top after dinner. Both fresh or frozen berries will yield the same tender cake, while chopped nuts can add a bit of crunch. Use peak-ripe strawberries for this deliciously disheveled treat. As the story goes, a Labrador sat on a picnic basket in the back of the car at Eton College, but guests ate the resulting "mess" anyway. 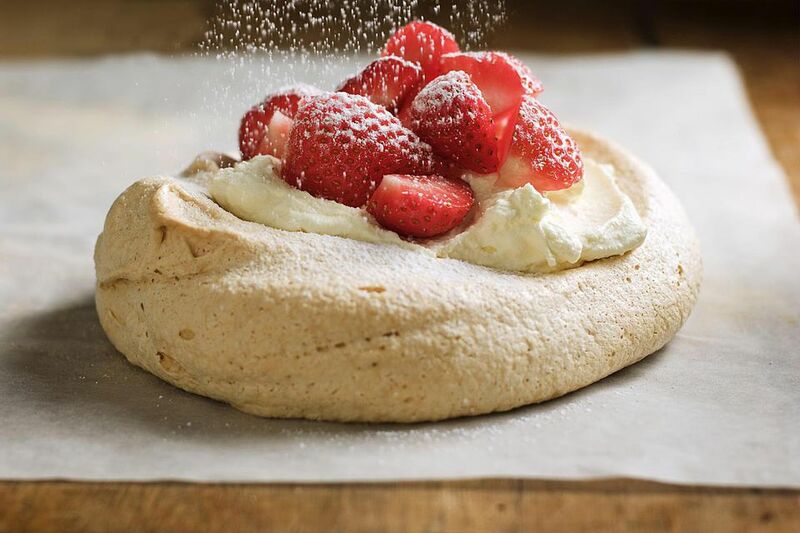 It might not be much to look at, but this combination of meringue, cream, and fruit is undeniably good. Give basic sponge cake or vanilla ice cream an elegant upgrade with a three-ingredient sauce. The recipe is as easy as it gets, combining sugar and your choice of berries with Cointreau or Grand Marnier. The liqueur adds a spicy complexity to the sweet, syrupy dessert topper. There are as many ways to make trifle as there are opinions about the Royals, but one thing's for sure: Everyone will be raving about this classic English confection when it hits the table. If serving to adults, soak the sponge cake in sherry; omit the alcohol if kids join the party. There's no need to include jelly if you're short on time, but it adds a nice textural contrast. Portion smartly and you can have your dessert and eat it, too. With whole-grain oats and berries rich in vitamin C, this guilt-free ​crumble isn't just good—it's also good for you. Make the most of summer's bounty, or use frozen berries once the cooler months roll in. If you like strawberry shortcake, you'll love this strawberry and cream pie. The luscious custard plays off the tart strawberries for a juicy, creamy bite. Using a store-bought shell saves time, but a homemade shortbread crust truly takes it to the next level. Your cast-iron skillet can be used for more than savory dishes. This skillet blackberry cobbler makes great use of the versatile pan to create a warm, bubbling treat. Serve it with a dollop of fresh whipped cream or vanilla ice cream for a real study in contrasts. Succulent blueberries go perfectly with this creamy, tart cheesecake built atop a buttery graham cracker crust. You can also make the glaze with another berry of your choice, or mix them all together for a big burst of flavor. The name "fool" dates back to about 1950 and refers to a dessert that's made with cooked fruit served with cream. This strawberry rhubarb version features a classic springtime pairing and comes together in a flash as a weeknight treat. What's better than a simple apple crisp? One that adds sweet berries to the mix. Combine your favorite fruits together in this warm twist on a classic. If you're feeling creative, substitute pears for the apples, blueberries for raspberries, or any other fruit pairings. The sky's the limit! For a dessert that looks as good as it tastes, look no further than this berry, lemon and mascarpone tart. You can even make the tart crust and fill it before serving if you're short on time the day of. Note that even though the filling doesn't need to cook, beating it into peaks does take a few minutes, so make sure you plan accordingly. When you just don't feel like making a fuss, opt for this rustic berry galette. Fill it with your choice of berries, but note that fresh instead of frozen work best in this case. The sweet, rich pastry tastes more complex than it is, but you can save even more time by using store-bought pie crust instead. Do you have bread going stale in your cupboard? Instead of tossing it out, transform the loaf into a berry bread pudding. While this recipe calls for blueberries, it works with just about any fruit you favor. Any style of bread will do—try it with challah or even raisin bread. For those who stay dairy-free, you can't beat a refreshing berry sorbet. Both fresh-picked and frozen blueberries can go into this recipe, so you can make it year-round. Once you've mastered the technique, feel free to swap in other fruits!